Beautiful views, outstanding fishing, all out relaxation. This cottage is perfect for 2-4 people. Available for all four seasons. Summer is a great time to rent for swimming, boating, sun bathing, making s’mores in the fire pit, cookouts on the grill and relaxing. Enjoy all that New Hampshire has to offer. Combine our two cottage rentals for larger groups. If you feel a need for a little more entertainment take a short ride to Weirs Beach. At night the summer sky and location is perfect for star gazing and hanging by the fire with friends and family. 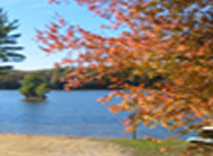 During the fall the spectacular view of the foliage is all around you from when you wake up till night fall. In the winter this location is convenient to all the ski areas, it's lake front property makes it an excellent place for snowmobiling, ice fishing and ice skating. This cottage is a 15 minute drive to Winnipesaukee, NH and all outlet shopping, great for antiquing or trying the great local restaurants. This location has a kitchen for 2 - 4 people. Kitchen is fully equipped with the following items and more: utensils, dishes, glasses, ice tray, can opener, pots and pans, paper towels, stove, refrigerator, sink, microwave, toaster, cabinets, table w/chairs and tiled floors. New bath and Shower, full bath, toilet, vanity, shelves and mirror -clean! Adult bunk beds comprised of a full mattress on the bottom and twin on top. TV w/ cable, full closet, bureau, carpeted. Flat screen TV w/ cable, view of the lake, pull out bed in sofa, coffee table, ceiling fan, carpeted, walk out the front door and you are standing on a 15 X 20 deck with chairs and a grill with a beautiful view of the lake. 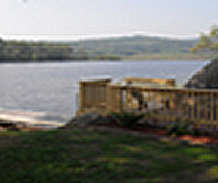 Plenty of parking , plenty of green grass, deck with grill, pier out to water great for fishing, swimming or boating. Fire pit. Local wild life watching.